‘Gudakdali’ is a Korean term that is used to describe something that is outdated. 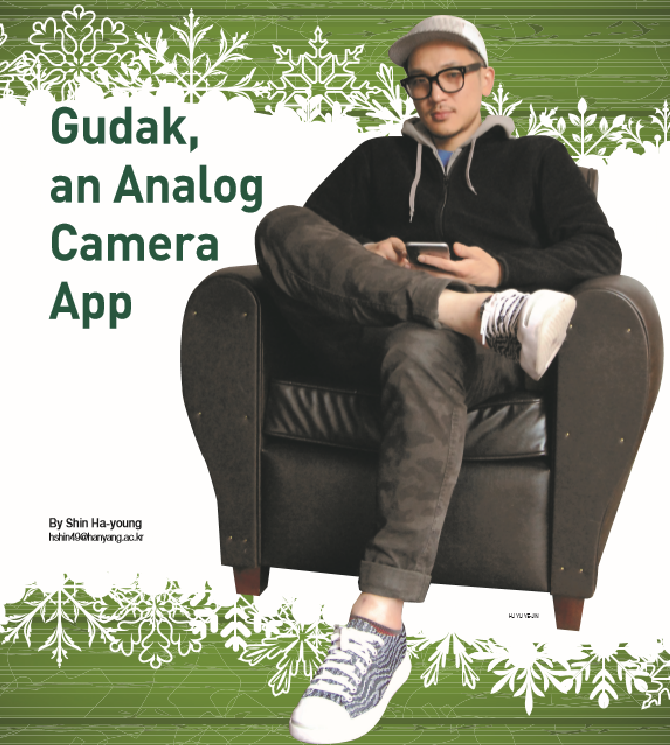 True to its meaning, the ‘Gudak’ camera app has stood out because of its analog concept. After its launch in July, it was ranked number one in App stores of many countries like: Korea, China, Finland, Philippines, and Thailand. Moreover, it is still popular among users today. The Gudak camera app minimizes the viewfinder and limits users to 24 photos per usage. The users also have to wait three days to see the pictures they took. Gudak’s ‘inconvenience’ helps to understand the beauty in waiting and brings a sense of nostalgia. 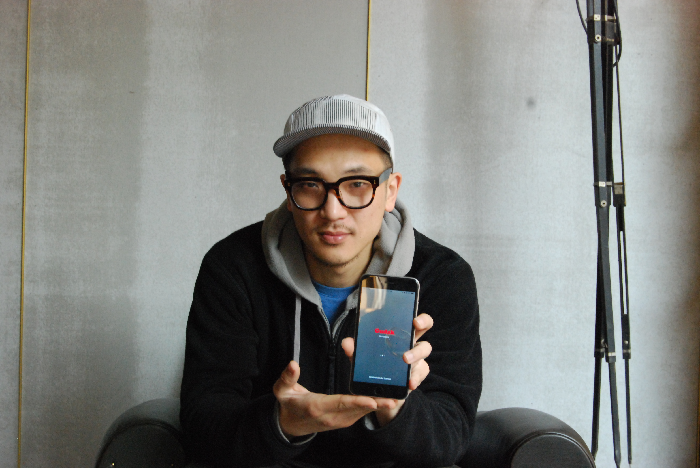 The idea of Gudak was started by Kang Sang-hoon, the CEO of Screw Bar. In today’s digital society, his creativeness has served as the best example of going against the grain. Q. Gudak was developed through a start-up venture called ‘Screw Bar’. Can you tell the readers what kind of business ‘Screw Bar’ is, and what the name stands for? A. ‘Screw Bar’ stands for distorting existing ideas and fixing them in a new unique way. Usually ventures end their names with ‘lab’ or ‘studio’, but I decided to end it with ‘bar’ because a bar is a place where raw ideas can be harvested. As for what we do, we mainly focus on designing unconventional products or services that people can enjoy. I first wanted to produce a disposable cup holder that could also be used for fashion. After designing the product, I visited the Starbucks Headquarters in the United States to pitch my idea. Through discussions, the idea constantly branched out and I ended up contacting Starbucks Korea, but we had to stop the plan due to insufficient funding. After that experience, I figured out that producing a software product would be more successful than producing a hardware product. Q. From what we know, Gudak was inspired by the disposable film camera. What we find interesting is that users can only take 24 photos and wait for three days for the pictures to fully develop. Could you elaborate on why Gudak is designed this way? A. People usually focus on choosing filters after they take a photo rather than focusing on the captured memory itself. I hoped that the users could experience the joy of waiting, and reminisce of the moment they captured the picture while they waited for their photos. Plus, there are just so many camera apps on the market that provide high quality technology. Thus, I thought it would be difficult to compete with those camera apps, so that’s why I decided to create it based on the analog concept that had its very own merits. As for the reason why we decided on the three days waiting period, it was because back in the days whenever we went to a photography studio to get our films developed, the owner would tell us to come back three days later. Additionally, scientists say it takes three days to forget a memory, but if you remind yourself of that same memory three days later, it develops into a long-term memory. Q. Were there any struggles during the application development process? If so, how did you overcome such difficulties? A. There were no big difficulties. The only struggle we had was communicating with the developer. Furthermore, after launching the app, our users reported errors that they have encountered. Unfortunately, they usually don’t include details like, which version of Gudak they were using or the type of phone they were using and how the error occurred mainly because not many people are aware that they need to include this information. However, because of this lack of information, it took more time to fix the errors. Whenever the speed of solving problems could not catch up with that of reporting problems, I always felt sorry for the users and was mentally distressed. These days I am determined not to stress out about it. Q. Since Gudak is so different from other conventional camera applications, were you not worried that Gudak might not be a success, especially in today’s society where people pursue convenience? A. I was afraid, but the ultimate goal of creating the app was not to be profitable, but to feel statisfied whenever someone enjoyed our ideas. Therefore, I enjoyed a lot rather than feeling concerned. I believe making Gudak was a meaningful challenge. To analogize, there are two ways to deal with environmental pollution: developing the technology or getting used to the inconvenience. For instance, when taking out food waste, people usually do it while going out somewhere else and use plastic gloves to not go back and wash their hands. But at this point, we are stepping forward to environmental pollution as we are using disposable products. Thus, we should adapt to the inconvenience. Gudak is the medium that trains people to get used to the inconvenience. As an example, according to elevator designers, it is very difficult to physically speed up the elevators. However, by installing a mirror in the elevator, people feel as if the speed got faster even though the elevator speed remains the same. As you can see here, I think design is the tool that solves the problem in changing people’s minds rather than focusing on the visible problem. Q. After the launch, Gudak ranked number one in app stores in sixteen different countries and is still currently evaluated as a popular app. Were you aware of this positive reaction? A. Of course. I feel grateful towards the public enjoying our app. The funny thing is, however, even though I’ve heard that many people use it, I haven’t actually seen people taking pictures with Gudak. It would be great to witness people using Gudak. Q. Some users who could not bear waiting to see the pictures have changed the date setting so that they could see the pictures as soon as possible. Did you expect such a thing to happen? A. One day, one of my students told me about this shortcut. I was surprised, but I told her to share that information with other people through her blog. As a result, the number of Gudak users increased. I personally have many thoughts on the pleasure of delivering messages to those who do not have the information. I believe that people who deliver good news through social media obtain influence, which may be the reason why that kind of promotion became quite effective, so knowing about this shortcut did not bother me at all. Q. What is your motto or phrase that helped you throughout your life? A. After I heard a saying: “A great person does great things.” on the radio, many thoughts went through my mind. I realized that ‘a great person’ stands for a well sound mind. Doing great things is not the only qualification for being a great person, but a great person does great things. Q. What is your ultimate goal as the CEO of Screw Bar and what is your individual goal? A. I have always thought that if I succeed, I would like to establish an educational institution in Korea. 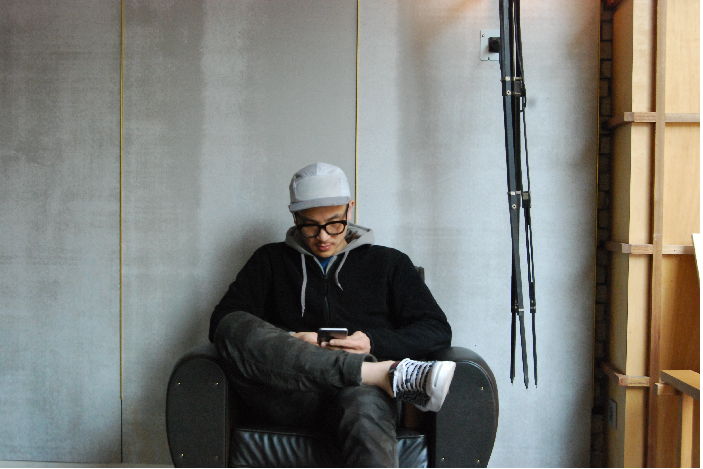 As I also run Artphil, an art school for studying abroad, at Apgujeong as a main business, many people suggest working as a full-time artist instead of working in an art school. However, as establishing an educational institution is one of my biggest dreams, I believe I could also learn through working in a school. Even though it may take some time to reach my final destination, I plan to follow my own map. In other words, I want to take a new, distinctive road. Q. Many students in Hanyang University (HYU) are interested in starting a business. As a successful CEO, do you have any advice to give to these students? A. All I want to say is to be patient. If the goal of designing Gudak was to earn money, it could not have lasted long. Instead, I considered it as one of my portfolios and ended up having fun during the whole process. I think a startup is also the same. If you put everything under one value, money becomes your ultimate goal. Furthermore, people usually suggest things that have already reached success in other countries, and this hinders you from facing new challenges. Make sure to experience various things by challenging yourself. Through this, you must set a designated time period when you can focus on start-ups. All the while, don’t hurry and you will be able to get good results.